One of the best caravan parks in Australia!!! The beach on one side and the main street on the other!!! An awesome family holiday destination!! 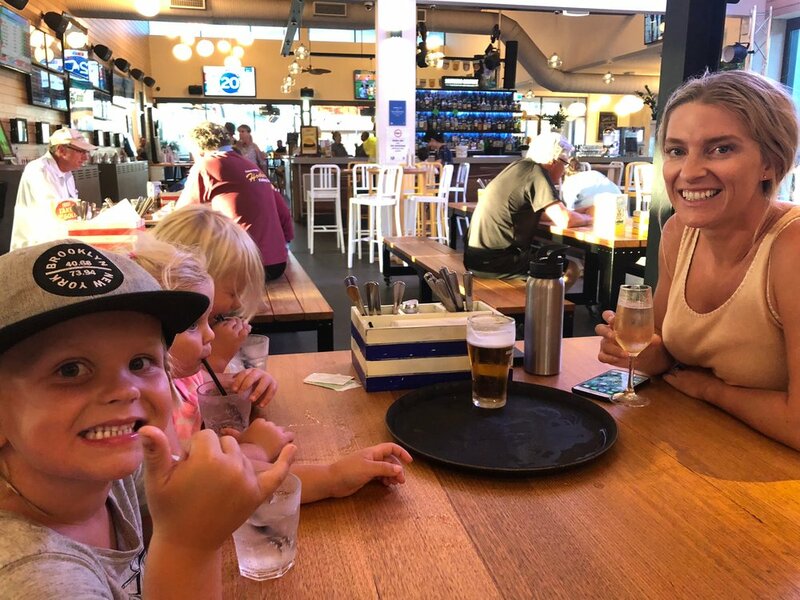 Situated in a quiet pocket of the Sunshine Coast, only 15 minutes south of the famous Noosa Heads you will find the bustling yet relaxed atmosphere of Coolum Beach. It really is tough to explain...... It just has a vibe and a feel that keeps drawing us back again and again. The Beaches and surrounding coastline are insanely beautiful and so easy to access without being overcrowded. And it's a SURF BEACH!!! The town itself is so easy to get around & it has such good facilities and shops right here. It has the Best Coffee in Australia at 'Compound Surf & Espresso'. Honestly the best we have drank around OZ!!! The people here are Awesome!! So happy and relaxed & why wouldn't you be living here!!! It has one of our favourite caravan parks in the country! The Coolum Beach Holiday Park. Located right on Coolum Beach itself, you can literally walk out the door of your van and be on the beach within seconds.. There are so many adventures to be had around here - Fraser Island, Bribie Island, Moreton island, all 4wd accessible and so awesome for camping. It has the best boardwalk running track along the coastline we have come across, a few hills, a few steps and workout stations along the way. This is huge for us because we love to keep fit on the road. It's totally LIVEABLE!!!! There are a lot of places that are more amazing and spectacular, but they are also very REMOTE with no schools, shops or airports.. So that's 10 things we could think of that make this place pretty awesome in our eyes. After twice around Australia searching the country for a new home base, we think we might have found it!! (when we are ready to settle that is) So much more to see yet. So now that you have planned in a stop here at Coolum to check out all the hype, here's some great things to do while your in the area. Climb Mount Coolum - Enjoy a steep trek to the summit of one of the Sunshine Coast’s ancient volcanic domes. Spectacular coastal views, wildflowers, birdlife and geology feature here. Coolum Aqua Park - The park covers a huge area, roughly 100 meters by 70 meters, and boasts a wide array of inflatable fun items for everyone’s enjoyment. Slides, blast bags, trampolines, swings, challenge tracks, balance beams, wobble pads and chill out areas, SO MUCH FUN!! Get onto Phippsy's smooth water charters, he's a legend in the industry and he'll put you onto some good fish in the Noosa River. Get a Bbq boat on the noosa river, top day out for the family. Get onto the crew at Oboat Hire, great guys that will sort you out for the day. SO THAT SHOULD KEEP YOU BUSY WHILE YOUR HERE ON YOUR FIRST VISIT!! THEN YOU CAN PLAN TO RELAX WHEN YOU COME BACK NEXT TIME. BECAUSE WE CAN GUARANTEE ONCE YOU'VE SEEN THIS PLACE, YOU WILL WANT TO COME BACK TIME AND TIME AGAIN!!! We love it here at Coolum Beach. One of favourite places around the country. This video tells you a bit more about the local attractions and what to do while your here on holidays. You need to hit up this place on your travels - AMAZING!!! A day trip up here is a must when your visiting the Sunshine Coast. Get the ferry across to North Shore and hangout on the beach. You can head all the way up to Double island point or just chill on the beach and Noosa River. Great day out!! What a great way to explore the Noosa River with the family!! Pack a BBQ lunch and float cruise around this beautiful waterway.